Controversial fencing proposed at Lowburn for a new Central Otago cycle trail has been shelved, as the trust behind the project says it has reached ''a compromise''. But the Central Otago Queenstown Trails Network Trust will reserve the right to put fencing or other barriers in place if the track is damaged by users, trust spokeswoman Janeen Wood says. And a proposed section along Brittany Cove is causing new controversy, as residents there say the trail should not go through that area. The Cromwell Community Board this week considered several presentations about the trail: an update from Ms Wood; a report from parks and recreation manager Gordon Bailey about the trust's request for the trail to pass over council reserve at Brittany Cove, near Pisa Moorings; and a deputation from Brittany Cove residents about the request. Shirley and Grant McLellan told the board it would be dangerous for the trail to go along the lakefront there because of some areas of ''zero visibility'' for people approaching the trail. They also said it would contravene the principles of the ''esplanade reserve'' status of that area. Mrs McLellan asked the council to refuse the request, to allow more assessment and public consultation to be carried out. Board members voted against a recommendation from Mr Bailey to approve the trust's request, after board chairman Neil Gillespie raised another issue. A 4m walkway that was a condition of the original Brittany Cove subdivision had never been built, and if a 2.5m-wide cycle trail was built too, little of the 10m reserve would be left, Mr Gillespie said. Council made no resolution about the walkway condition, and it would be for council staff to decide what to do about the issue now, he said. It would also be for the trust to decide what to do to get the trail past the Brittany Cove area. The board noted the ''compromise'' the trust had reached over proposed fencing of the trail. 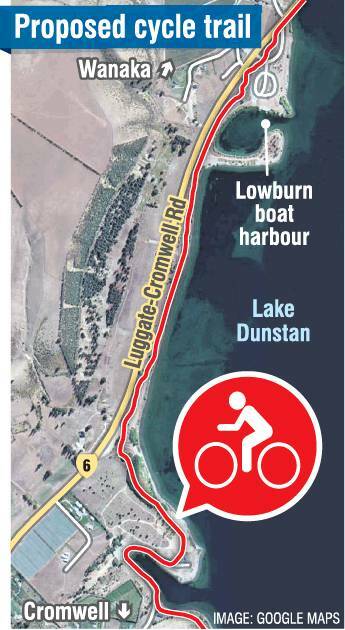 Proposed fencing of areas of Lowburn lakeshore had drawn criticism from many Central Otago residents, who did not want to lose vehicle access to the areas. More feedback was gathered over the summer and the trust knew ''Cromwellians were very passionate about their vehicle access to some lakefront areas'', Ms Wood's report said. However, the trust also knew some users could damage the ''fragile slopes'' around the lakefront. Maintenance of the trail would be paid mainly by the trust, and it did not want ''to have a small section around Cromwell use up the majority of our funds'', she said. The trust had now decided not to fence the area around the Lowburn Harbour, as initially suggested. However, the trust would reserve the right to put in fencing, bollards or boulders later on if the track was being damaged or ''abused'' by other users, Ms Wood said.